Hill Farmstead Brewery - The Early Years - Onward into Spring…and Vermont? In the fermenters right now, we have some particularly wonderful upcoming beers. Two different versions of a Belgian Trippel (one brewed with Orval yeast, a la La Rulles, the other brewed with Rochefort yeast and Honey) - the La Rulles inspired Trippel is destined for Tokay barrels and a marriage with Brettanomyces. We also, as I mentioned before, just brewed a 27 Plato Braggot - 200kg of Maris Otter/200kg of Orange Blossom Honey (Orval yeast and to be finished with Champagne yeast). The intention is to barrel age a fraction of this collaboration as well. Yesterday I brewed my Brettanomyces Saison - not that any of the followers of this blog will remember (nor have they ever attended...?) Belgium Comes to Cooperstown but this last batch of Saison is loosely based on my Substance D (from The Shed) as well as the Saison that I brought to BCTC in 2007. And so forth... it is all too likely that I will blend a fraction of this Saison (aptly titled Saison Vermont, I think) with 3-8% of the 2 year old Drie Fonteinen that I just carried back with me over the weekend (think of the Saison from Yvan at De La Senne - which I tried at Poechenellekelder on Friday evening) and have it available at the pub and the Copenhagen Beer Festival in May... also very likely that I will debut the Oud Bruin and the Barrel Aged versions of the SEVEN at the same festival and the pub (on the same weekend). What else? Well, perhaps eve more importantly than all of this rambling, is the fact that I have finally come to terms with a feeling that I had upon returning to Copenhagen from Vermont at the end of December. The feeling of which I refer is best expressed as a notion that "this is what it feels like before the storm..." or "this is what it feels like when you make the wrong decision to return to a location." I somehow knew that I would not be able to make the move back homeward to the country, to the bucolic woodland and serenity of lonely Northern Vermont and Greensboro until I had tired of population density - had my fill of asphalt, cars, foreign language, consumerism, absence of trees, the subtle tones of alienation, and the constant cough/congestion/and 'sickness' that has become so very characteristic of my stay here (indeed, the very opposite of my life in Vermont where health is normative). What does this all mean? Well - I guess it means that, yet again, I am sincerely considering *the* departure. A real going away party. Listening and honoring those misanthropic tendencies within me that are discouraged here... and... working for myself. Returning to the life of impoverished artist. Struggling cynic. And, I dearly hope, the rebuilding of a once abundant farmstead alongside the motivation and vision of my brother. Anyone have a 7 barrel direct fired kettle that they would be willing to part with? Foolishly, I am ignoring the wisdom of my good friend John Kimmich (The Alchemist) and postponing any thought on opening a brewpub. Instead, I will launch head first into a barely profitable, ridiculously consuming life as a single employee owner/brewer/distributor. Why not? Thus, onward with permitting and the remnants of work that needs to be completed. 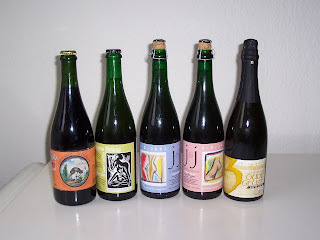 I'll be living off of pasta and 50 bottles of Drie Fonteinen (what is that? 2 a week?) for the next four months. Feel free to send contributions in the form of solid foods, beer/libation, or surplus brewing equipment. No licorice, please. OH! And I almost forgot - Tomme Arthur will be joining me here at Nørrebro for a guest brew the first week of March. Not quite sure yet what we'll be brewing... but I'm pretty sure that it won't be too bad. Only trouble with all of these barrel aged beers is that if I leave, I won't get to taste them... and... who is going to look after them? Not remember Substance D, or Annika, or your other saisons?? Who are you kidding? I remember damnit!